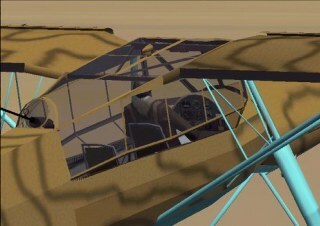 Feiseler Storch for CFS2, German recon aircraft, full moving parts, panel, tailgunner, and excellent paint scheme. The Storch (Stork in English for its thin landing gear) was used by the Germans in World War Two as a light liason aircraft and commications runner. It was used often to ferry German dignitaries and officers. Designer and Credits due to: Greg Law, Steve McClelland. This CFS2 version is a dream to fly and is very pleasant to use. I recommend it greatly. And it seems as if it will never stall! Lower the flaps and it's a kite .... lol.